Is it possible to have thubnail preview in the Windows Explorer for VDML and VDCL files ? A new dll named vdfext.dll is available for developers and their customers in order to be able to see the preview image of a VDML or VDCL file in the windows Explorer as thumbnail. This dll must be registered in the system's GAC. Note that not all VDML VDCL files contain a preview image inside them, as the developer has the option to add or not such a preview image during save. 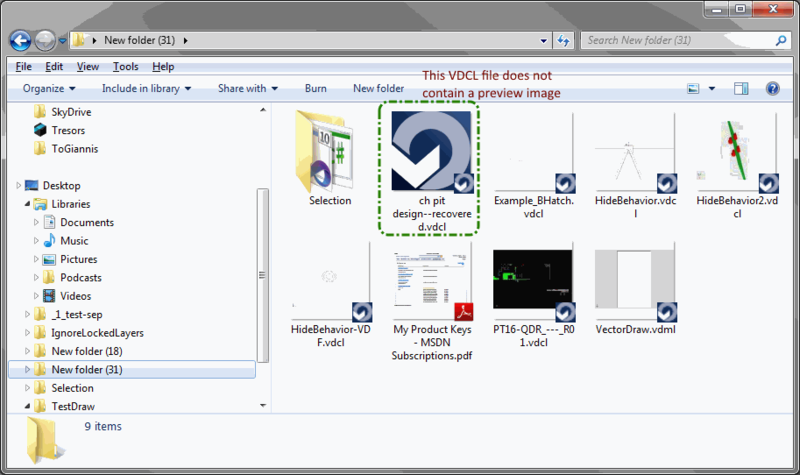 If the vdml/vdcl file doesn't contain a preview imageg then a default icon is shown. This dll work in Windows XP, Vista, Seven, Windows8/8.1 in 32bit (x86) and 64bit (x64) installations. The only prerequisite is the .NET 2.0 Framework that has to be installed in the system. The VDF components are not required, so it is not necessary to be installed or present in the system! It is a stand-alone dll. In the same folder as the vdfext.dll there are also some other files. 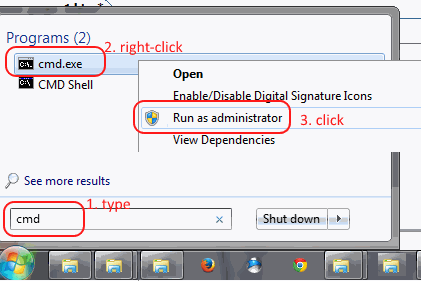 The vdfextInstall.exe is an application that installs or uninstalls the vdfext.dll in the system by using the switches -r (register) or -u (un-register) respectively. The two batch files (install_vdfext.bat and uninstall_vdfext.bat) run this executable with the necessary switch and install/uninstall the vdfext.dll in the system. Make sure that you do not delete this folder or keep a backup of it as it necessary if you later decide to install/uninstall it from the system. In Windows XP just log in with user administrator or user with administrative rights and run install_vdfext.bat or uninstall_vdfext.bat to install/uninstall it from the system. In Windows Vista/Seven/Windows8/8.1 you need to open a command prompt (cmd.exe) with administrator/elevated rights, go to the folder where the dll is and in command line run install_vdfext.bat or uninstall_vdfext.bat to install/uninstall it from the system. After installation/uninstallation a reboot is required. 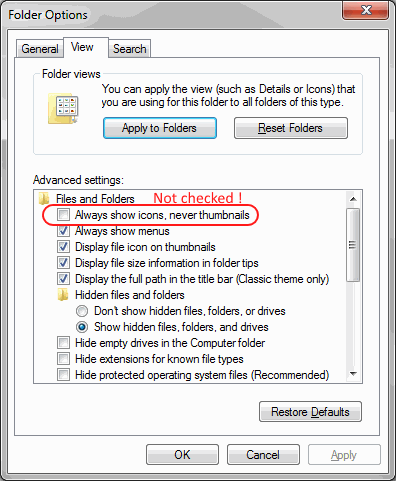 If you have trouble viewing the thumbnails in the Windows Explorer then make sure that the folder's view mode is in "thumbnail" view, and also that in the folder options the "Always show icons, never thumbnails" is NOT checked. 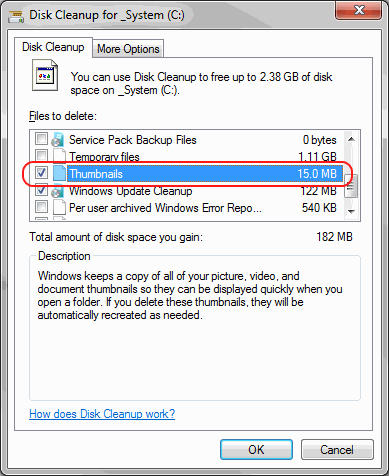 If this doesn't solved the problem then open system's Disk Cleanup utility and cleanup the Thumbnails to "clear" the cache and the system rebuild the thumbnails cache.